Pick Analysis: Ifeadi Odenigbo (if-AH-dee o-DEN-uh-bo) came to Northwestern as one of the top recruits in the country, even though as the son of Nigerian immigrants he didn't participate in football until his sophomore year of high school. Statistically, Odenigbo made an impact as a pass-rushing specialist in his first three years, bringing down the quarterback 13.5 times among his 29 tackles in 36 games from 2013-2015. He may have made a similar impact as a true freshman in 2012, but redshirted after suffering a season-ending injury in the opener. Odenigbo bulked up for his senior year, allowing him to garner honorable mention All-Big Ten accolades (22 tackles, 12 tackles for loss, 10 sacks, two forced fumbles). He even got to play against his younger brother, Tito, who is a rising junior defensive tackle for Illinois. 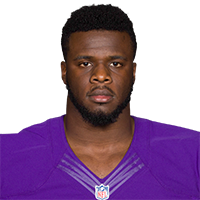 The Minnesota Vikings select Northwestern defensive end Ifeadi Odenigbo in Round 7 with the No. 217 overall pick in the 2017 NFL Draft. Published: April 3, 2017 at 01:53 p.m.
Northwestern defensive end Ifeadi Odenigbo goes through drills at the 2017 NFL Scouting Combine.